Agazit Afeworki, who finished her credits this past December, was placed in this year’s Hearst Awards Multimedia News Competition for her work reporting on the Eritrean and Ethiopian communities. She placed 14 among more than 100 applicants from across the nation. Cook said Afeworki has a quiet and confident presence in the classroom and in her journalism work – making thoughtful connections to people whose stories she tells and leading to excellent journalism. 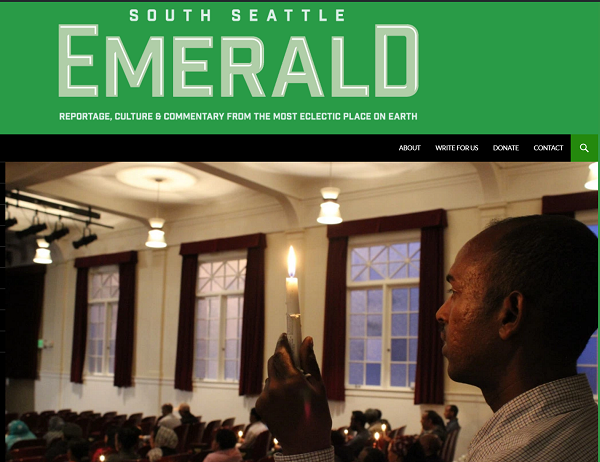 Afeworki’s written article and two and a half minute audio piece, which covered two vigils proceeding one of Isis’ documented beheadings of Eritrean and Ethiopian emigrates, was published in the South Seattle Emerald. With the aim to work at a magazine that is “always on the brink of style culture and that rallies readers behind compelling features and visuals,” Afeworki has been freelancing, interning at GRAY Magazine, and working in Space (a department in Nordstrom that carries emerging and advanced designer collections curated by Olivia Kim). Cook reminds UW journalism students that these awards are not just won by the top one percent at big journalism schools, and stressed the importance of putting your work out there.